Take screenshots and shutdown with one click in the Dock. Is there a better alternative to OneClickGo? Is OneClickGo really the best app in System category? Will OneClickGo work good on macOS 10.13.4? Place OneClickGo in your Dock and you can shutdown your computer or take screen snapshot in one mouse click. OneClickGo is a convenient tool for your daily use, you don't have to remember those Apple hotkeys hereafter. - Let your Mac go into Sleep Mode. 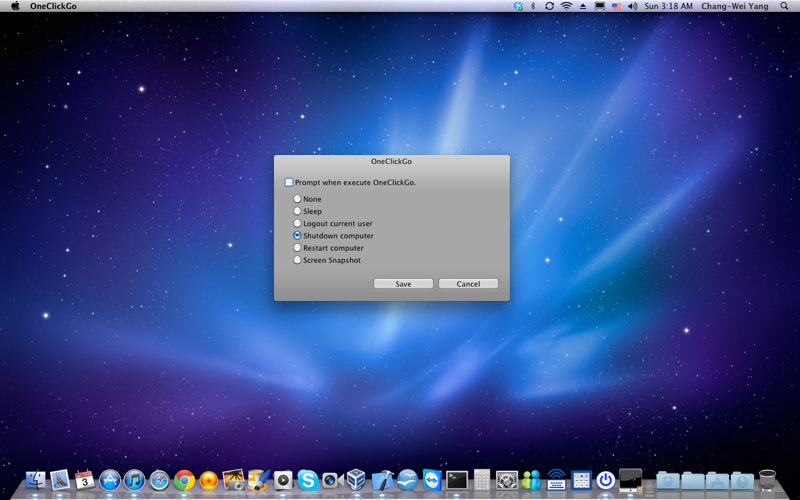 If you want to re-configure OneClickGo, execute OneClickGo while pressing Option key. OneClickGo needs a rating. Be the first to rate this app and get the discussion started!